Built within a charming old Venetian building, this quiet property is located in the heart of the Old Town. Ideal for adults and couples wanting a base to explore, there is a variety of local restaurants, tavernas, and bars nearby. 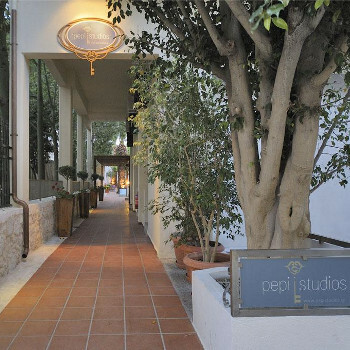 Just back from our second visit to Pepi studios. As I walked through the gate I felt all my cares and stresses flow away. its like walking into a secret garden. This time we had a room with a balcony at the front of the studios it was a little noisy but brilliant for people watching. Its set in the old town of rethmynon. if you want entertainment, music, then please don't come to Pepi leave the peace, quiet and tranquility to those of us who can enjoy it. First Choice reps were quite rude to the locals please and thank you didn't come easy to them but then I always try to steer clear of the reps! Package holiday purchased from First Choice via Thomas Cook Retail. 2 August 2005, 14 nights, self-catering. 2 adults, 2 children (9 & 6). We stayed in room 3, although basic it was good enough-3 large windows let in lots of light,air and noise! The people in the adjoining property had a dog kennel adjacent to our bathroom window with 2 large german shepherds that barked all night. The walls between us and room 2 seem to be very thin as we could hear every word that was said! Combine these things with the noise from outside and we didn't sleep for a week. Luckily our 2 friends in room 4 swapped with us for the 2nd week. I recommend room 4 it was so peaceful! I wouldn't even bother complaining to the rep, as we did about the dogs and noisey neighbours, as it didn't do any good as they wouldn't move us. On the good side, the garden is lovely and the maid was very helpful and friendly. We travelled to Crete on honeymoon for 2 weeks and were very much looking forward to the perfect break after our lovely wedding, only to be met with total disappointment. After travelling since the early hours from Bristol airport, we arrived at a dark and dingy apartment which was on the ground floor only a few steps from the pool. It was possibly the worst located room in the building (room 12, should have been renamed room 13!). We would step out each day to find chairs blocking our door which we found very rude. We were given this room despite the fact we requested a room with a balcony, although we knew this was not a guarantee, none of the rooms even had a balcony. All the rooms upstairs had a window with a bar across it, and although the First Choice operator asked if we would like a sea view, none of the rooms had a sea view at all! In fact, I think the only way you would have seen the sea from these apartments would be if you stood on the top of a ladder on the roof!! We booked through Frirst Choice and this was our 8th trip to Crete. We've booked with different companies or travelled round independently on other trips. It was an absolutely wonderful apartment block for us: Once of the best we've ever stayed in . I would say best for people who book the 'studios' as opposed to what are described as 'apartments'. Also try to get an upper floor. We had a lovely balcony overlooking a pretty street and could watch the world go by. The ground floor studios did not look quite so nice in terms of sittign out - they had their own little terrac e area but it overlooked the (quite nice) garden of a bank. . The apartments have a mezzanine floor and did not look big enough for 4. This place is best for couples. try to get the rooms I describe. We stayed in May, so the lack of air conditioning was not a problem for us - the weather was warm and the apartment was a nice and cool retreat at that time of year. Also best for people who are looking for something *other* than a beach or pool holiday. There is plenty of that type of holiday available elsewhere. And maybe best for people who know Crete a bit and are relatively self-sufficient, as there is not a rep or apartment owner on site much of the time. The cleaners are incredibly nice though and cleaned our place every day. We spoke a little bit of Greek and found that helped as they spoke almost no English. We did not find a problem with cleaniliness: it was spotless, though I would take into account that we stayed right at the start of the season. I was extremely impressed by the location of the apartments. They are in the lovely old part of Rethymnon, in a relatively quiet street. It is quite unusual to find places offered by tour companies in this area. You can get to all the sites really easily. If you hire a car be warned that you won't be able to park nearby. Pepi apartments are really lovely and full of character - a very simple and tasteful conversion of an old Venetian house. The kitchen is very small indeed and really only suitable for snacks; this is not a problem as there are hundreds of great places in town. There is a fridge for keeping drinks and snacks cool as well as a two ring hot plates and simpel but adequate cutlery and crockery 9all very clean in May) If you want to do a lot of cooking this is not the place for you. The garden & pool is really delightful but it is not a swimming pool and is not described as a pool in the brochure, so we got exactly what we were expecting. A cute and pretty place to sit or cool off with a quick spalsh - I think there is use of a bigger pool at another hotel in town, but we didn't try it. Read the brochure carefully, think about what you want from the holiday and I think, if you feel it is right for you, you will finds this a wonderful, exciting and characterful desitination. As this is a Self Catering Studio, seperate from the main hotel, most of the criteria do not apply. However we were extreamly pleased with the flat, if a little shocked initially at the size - there is absolutely NO way this could have accommodated 4 adults! It was fine for the 2 of us. The kitchenette has only 2 rings (electric) and a fridge underneath & there is no storage space for your groceries. The pool area was charming - lovely palm trees and plenty of shade or loungers in the sun for those who prefer.My only real criticism would be there were no areas for hanging laundry, not even to dry your swimming things or smalls. The location in town was excellent. Only 5 minutes from shops or the beach, and being in town there was plenty to go and do. The rep from First Choice was charming, if a little overawed by everything, but was helpful and funny.